I don't care what they show on Star Trek or Star Wars, space is not an ocean. 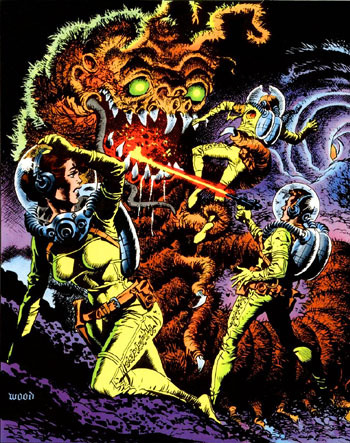 Far too many SF shows make the scientifically inaccurate assumption that space travel will be just like ocean travel. This is very wrong. In particular, space is not two-dimensional, there is no friction in space, and spacecraft will not have their decks laid out as if they were seagoing vessels. 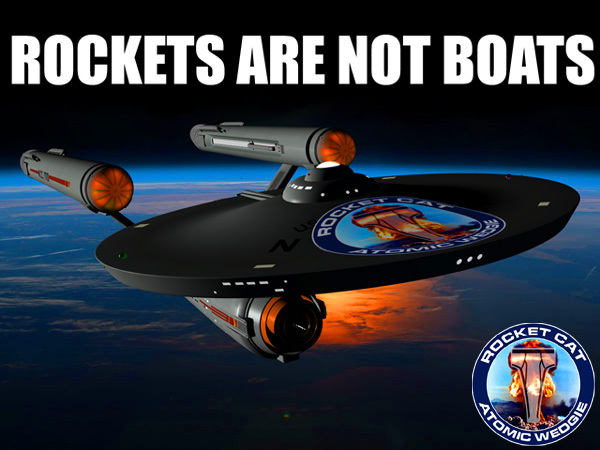 No Space Sailing allowed! More debatably, spacecraft classes will probably not be named after naval ship classes (e.g., Cruiser, Battleship, Destroyer, Frigate, etc. ), the military rank structure will probably be more like the Air Force instead of the Navy, and space pirates are highly unlikely. Space is three dimensional, not two dimensional. This bad trope is an outgrowth of the "space is an ocean" fallacy. Spacecraft are not limited to moving on a surface like a boat, they can go "up" and "down." They are not even limited like a aircraft, the latter is limited to how far up and down they can go. A spacecraft can theoretically fly to infinity in any given direction. There is no limit on their orientation either. If you saw the Starship Enterprise approaching the Starship Intrepid and one was "upside down" with respect to another, you might think this was wrong but in reality there is nothing preventing this. Even worse: the nose of the other spacecraft might not even be pointed in the direction the ship is flying. This makes unloading a broadside on an enemy spacecraft much more challenging. They can approach you from any direction, not just in a two dimensional plane. 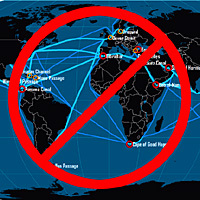 There are no "shipping lanes" in space. Your starting planet is whirling around the primary sun, the destination is also whirling at a different rate, the relationship between them is constantly changing. Chances are each transfer trajectory is unique, no other spacecraft will ever follow the same path again. So you can forget about interplanetary convoy raiders lurking near a shipping lane, there are no shipping lanes. The same goes for pirates and privateers. The best you can hope for is a clustering of ship launching during the months-long window for Hohmann minimum energy trajectories open between inhabited planets. And even then the ships will probably be spaced millions of kilometers apart, unless they are in a convoy. Well, there is an exception. Alisair Young pointed out to me that while there are no shipping lanes between planets, in places that are crowded with spacecraft you certainly are going to have the equivalent of air-traffic controllers. No shipping lanes in the large (interplanetary/interstellar) space, definitely, but I'm willing to go out on a limb (as per my Outbound ) and argue that once a chunk of local space (near a habitat, beanstalk, hypothetical stargate, particularly space-oriented planet, etc.) gets much traffic at all, it's going to acquire plenty of local station-relative lanes, orbital slots, holding zones, standardized parking orbits to intercept at Orbital Level Ten, etc., etc., and all the other impedimenta of space-traffic control, along with people whose spacecraft go off the traffic pattern being treated to Loudness, Lasers, and Lawyers, not necessarily in that order. It'll be even worse than airports for "too much KE (kinetic energy), lives, and money in too small a space". I don't care how the Starship Enterprise or the Battlestar Galactica is laid out. With a scientifically accurate rocket, the direction of "down" will be in the same direction that the rocket exhaust is shooting. 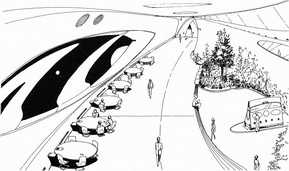 In other words, a spacecraft will have the general internal arrangement of a skyscraper, not that of a passenger airplane. The floors will be set perpendicular to the axis of thrust, and "up" will be the direction the spacecraft is thrusting. This is one of the most persistent misconceptions, due to the unfortunate fact that practically all spacecraft in SF media get it wrong. I'm looking at YOU Star Trek, Star Wars, and Battlestar Galactica! This bad trope is an outgrowth of the "space is two dimensional" fallacy. Some SF shows go so far bad that they make their spacecraft like boats. Even to the point of stupidly placing the ship's Bridge perched on the "top" where it will be shot off by hostile weapons fire, instead of deep in the core of the ship where it will have some protection (Star Trek and Uchuu Senkan Yamato immediately come to mind). I don't care how the X-wing and Viper space fighters maneuvered. 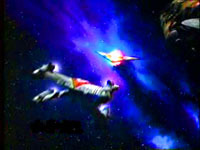 It is impossible to make swooping maneuvers without an atmosphere and wings. You also cannot turn on a dime. The faster the ship is moving, the wider your turns will be. Your spacecraft will NOT move like an airplane, it will act more like a heavily loaded 18-wheeler truck moving at high speed on a huge sheet of black ice. There is also some question of whether space fighters make any sense from a military, scientific, and economic standpoint. And another thing: if you maneuver, you are NOT going to be slammed into walls by high gee forces like a NASCAR race car driver. It doesn't work that way unless you have an atmosphere and wings. The only thing you will feel is a force in the same direction that the rocket exhaust is shooting, which will be equal to magnitude to the acceleration the engine is producing. 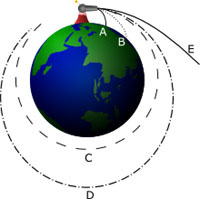 Since Rockets Are Not Boats, the force generally be in the direction the crew considers as "down", as defined by the rocket's design. It will never be "sideways" (except under silly situations, like occupying a spinning centrifugal gravity ring while the rocket is accelerating). It doesn't matter if you are thrusting in some other direction that the rocket's direction of travel (see Rockets Are Not Arrows) nor does it matter the rocket's current velocity (relative to what?). If the rocket engine cannot provide more than 0.5 gs of acceleration, the crew is never going to feel more than 0.5 gs of acceleration. Even if the ship is moving at a large fraction of the speed of light. But if you simply must have space fighters, they will act like this. An airplane turns by banking off the air. The air simply redirects the momentum of the plane. For this reason, a plane can turn with its engines off. Public Domain Image, source: Christopher S. Baird. A space ship turns by reorienting and then firing its engines in the desired direction as there is no air to bank off of. Public Domain Image, source: Christopher S. Baird. Spacecraft do not necessarily travel in the direction their nose is pointing. 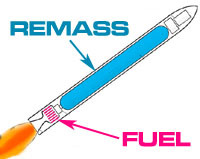 During an engine burn the thrust will be in the direction of the nose (and the exhaust will go in the opposite direction). But once the thrust is off, the ship can turn to any orientation. It can fly "sideways" through space if it wants. This can be important during space combat, in order to get your ship's weapons to bear on the enemy. Say your ship is traveling in direction X at a certain velocity. To increase its velocity in direction X (accelerate), it has to point its nose in that exact direction and do an engine burn. To decrease its velocity in direction X (decelerate), it has to point its nose in the exact opposite direction and do an engine burn. If it burns in any other direction, the ship will accelerate or decelerate while simultaneously changing the direction it is traveling. If you look at most blueprints for the various iterations of the Starship Enterprise, you will notice that every single part of the spacecraft interior is pressurized, with doors, rooms, and toilets. The corridors are wide enough for five people to walk abreast on nice carpeted floors with indirect lighting. This is ludicrously wrong. 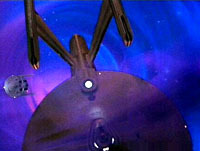 And it is not just Star Trek that does this, pretty much all of media science fiction has ships like this. TV Tropes calls this fallacy "Starship Luxurious". This is an extension of the "Rockets are Boats" fallacy. Passenger aircraft and luxury liners have their entire interior pressurized because so is everything else at sea level on a planet with a breathable atmosphere. For free. So careless starship designers, without a thought, made the unconscious assumption that spacecraft would be totally pressurized as well. Wrong. Tain't no air in space, and atmosphere is expensive when you have to cart it up out of Terra's gravity well. Not to mention the expensive pressurized hull that has to encase it. And it is not just the cost of hauling it up the gravity well, the spacecraft's engine has to accelerate the mass of all that junk. Every Gram Counts, so every gram of carpeting, atmosphere, and pressure hull is one less gram of payload, i.e., the reason the spacecraft was created in the first place. See The Tyranny of the Rocket Equation. In the real world, spacecraft will be mostly tanks of propellant, propulsion system, payload bays, and a lacy lattice-work of support struts holding everything together. The part the people live in will be a tiny pressurized habitat module tucked away somewhere. Ignorant starship designers have the unconscious assumption that the important part of a spacecraft is the crew, so they designed ships with their priorities reversed. Their ships were mostly gigantic habitat modules with a tiny engine stuck to the rear. Their ships are also ludicrously wrong. If the designers thought about it at all, they might grudgingly include a tiny fuel tank. Which is like the cherry on top of their big icecream sundae of Fail. So quit drawing ship blueprints with every square inch pressurized and human-accessible. On a real spacecraft if the ship's engineer has to repair the propulsion system, heat radiators, power plant, propellant tanks, or anything like that, they will have to put on their space suit. They will not have the luxury enjoyed by Scotty the engineer, waltzing down a carpeted floor in a shirt-sleeve atmosphere. Spacecraft have no need of windows or portholes, for much the same reason as a submarine. (No, the Seaview doesn't count. Strictly science fiction. There are no panoramic picture windows on a Trident submarine). Windows represent structural weakness, and there really isn't much to see in any event. Unless the spacecraft is orbiting a planet or docking with another ship, the only thing visible is the depths of space and the eye-searing sun. And unlike submarines, windows on a spacecraft also let in deadly radiation. The windows on the Apollo Command Module (CM) also have to withstand the searing heat of atmospheric reentry. Any windows will be tiny like the ones on the Apollo CM (side windows are 33 cm square, docking windows are 20 x 33 cm). The only reason for larger ones is if the spacecraft has to do a piloted landing and you don't got a glass cockpit (e.g., the Apollo Lunar Module or the Space Shuttle. LM windows are 64 x 71 cm triangles). The cupola on the International Space Station has the largest windows used in space to date (80 cm). Star Trek, Star Wars, and Battlestar Galactica to the contrary, space battles will NOT be fought at a range of a few feet. 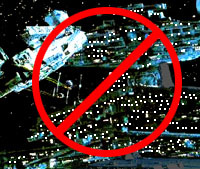 Directed energy weapons will force ranges such that the enemy ships will only be visible through a telescope. Watching a space battle through a port hole, you will either see nothing because the enemy ships are too far away to see without a telescope, or you will see nothing because a reflected laser beam or nuclear explosion has permanently robbed you of your eyesight. When traveling in a wet boat from port city to port city, the boat does not have to worry about the destination moving around. It just aims for the location of the destination port. That port is part of the continental bedrock, it isn't going to move any faster than continental drift. That ain't true in space. Everything is moving. 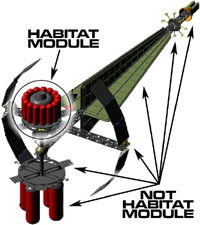 Therefore the astrogator does not aim the rocket at the location of the target. They aim the rocket where the target will be when the rocket gets there. They "lead the target" in other words. Just like a duck hunter. For instance, if a chemical rocket is departing Terra bound for Mars on a Hohmann trajectory, the trip will take 8.6 months. 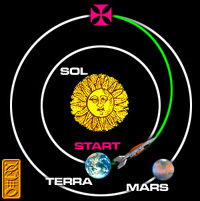 Mars travels in its orbit at a speed of around 24 kilometers per second. So if the astrogator stupidly aimed the rocket where Mars is at now, by the time it arrives Mars will be more than five hundred million kilometers away. The astrogator can aim for the planet's current location if they are in a torchship, which in this case means a rocket powerful enough to make the trip in a couple of days. Or quick enough so that the planet does not have enough time to move much. A torchship powerful enough to do a 1 gee brachistochrone can do the Terra-Mars trip in two days flat. In that time Mars will only have moved about 500 planetery diameters, which will only add a few minutes to the trip. There is no friction in space. Here on Terra, if you are driving a car and take your foot off the accelerator, the car will coast to a stop due to the friction of the road. In space, if a ship turns off its engines it will maintain its current velocity for the rest of eternity (unless is crashes into a planet or something). In the movie 2001 A Space Odyssey, you may have noticed that the spacecraft Discovery was traveling to Jupiter with nary a puff coming out of the rocket motors. This is why it makes no sense to talk about the "range" of a rocket. 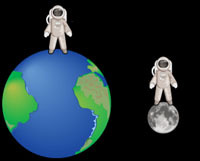 Any rocket not in orbit around a planet or in the Sun's gravity well has a range of infinity. In theory it can do a burn and travel to, say, the Andromeda Galaxy, it is only that it will take millions of year to get there. Instead of a rocket's range, one should talk about a rocket's delta V capacity. If you want to get an intuitive feel for how spacecraft move, I would suggest playing one of the few accurate spacecraft simulation games available. There are a few suggestions here. In space, there is no practical way to hide your military spacecraft from detection by the enemy. 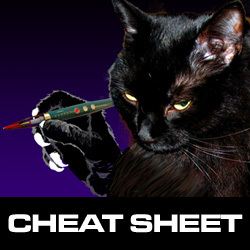 Before you get all indignant and try to refute this, read through the details in the link. You will probably find that any arguments you can muster have been brought up a million times before. In any event, you should also first read about Respecting Science. I don't care how many space battles you have watched with ships going swish and explosions going BOOM! There is no air in space so neither is there sound. In space no one can hear you go ka-blam. Only a couple of TV shows got this correct, notably Babylon 5 and Firefly. The only common exception is that if a nuclear warhead goes off within a few hundred meters of your ship, the flood of x-rays might cause the hull to flex and create a sound. The practical consequence is that if you are in a spacesuit on the Space Station, you cannot move everything by tapping it with your pinky finger (you may start it moving at a rate of one millimeter per week, but that is close enough to "cannot" for government work). The Space Shuttle may be floating next to the station with a weight of zero, but it still has a mass of 90 metric tons. If it is stationary and you pushed on it, there will be very little effect (in fact, about the same effect as if the Shuttle was sitting on the tarmac at Cape Kennedy and you gave it a shove). And if it is moving slowly on a collision course with the station, and you are in between, the fact that it has zero weight will not prevent it from crushing you like a bug despite your attempts to stop it. It takes just as much energy to stop an object as it took to start it moving. Sorry, but your orbital construction crews will NOT be able to manually manipulate multi-ton girders like they were toothpicks. The other factor to consider is Newton's Third Law. If you push on a girder, there will be both action and reaction. Since the girder has more mass, it will start moving a microscopic amount. But since you have less, you will start moving in the opposite direction with much more velocity. This renders many common tools unusable in the free fall environment, such as hammers and screwdrivers. You see, the Station is in "orbit," which is a clever way to fall but never hit the ground. You can read more about the details here. So people in the Space Station are in "zero gravity" in the sense of "undergoing an acceleration of 0.0 gs". Just like the Apollo astronauts are crushed by an acceleration of 3.94 g when they lift off. Related terms are "free fall" and "microgravity." Markus Baur points out that aliens invading Terra to steal our water makes about as much sense as Eskimos invading Central America to steal their ice. 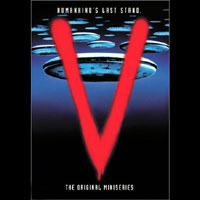 I'm looking at YOU, V.
There is no need to come to the earth to get water - it is one of the most common substances "out there" ... so why take the time to drive all those light years to get something you can get a lot more cheaply (and without those pesky human resistance fighters) around the corner? That round room in the Starship Enterprise? The one they call the "Bridge?" Wrong term, that thing is a Combat Information Center (CIC). On a real wet-navy vessel, the bridge is a tiny two-station place used to control the the movement of the ship. It only had stations for the navigation and helm. In other words, the "bridge" on the Starship Enterprise is that little console that Sulu and Chekov sit at. The CIC is where all the data from the sensors, scoutships, intelligence agencies, central command, and other ships is gathered and evaluated. The important information is passed to the captain along with tactical suggestions. Exactly the way Uhura, Scotty, and Mr. Spock pass information and tactical suggestions to Captain Kirk. Amusingly enough, real world CICs resemble the one on the Starship Enterprise, because the US Navy was actually inspired by Matt Jeffries design. Even more so, the US Navy got the very concept of a CIC from the classic science fiction novel Gray Lensman by the legendary E. E. "Doc" Smith.